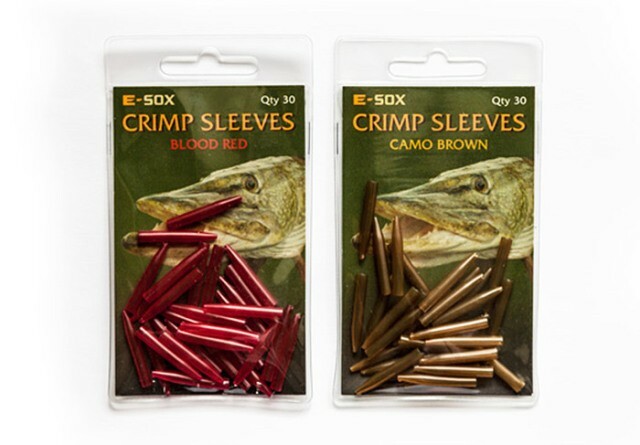 E-Sox Crimp Sleeves are hard­wearing yet flex­ible and designed to cover the eyes of hooks, swivels and crimps to create a stream­lined and neat setup. These tapered sleeves are avail­able in trans­lu­cent Camo Brown for a dis­crete setup or a more dis­tinctive Blood Red to create extra visual attraction. Each packet con­tains 30 Crimp Sleeves. Looking to buy some End Tackle / Accessories as part of a fishing gift? If you would like some advice on purchasing End Tackle / Accessories, simply contact our expert fishing team, giving us either an email or phone number on which to contact you and we'll get back to you right away with the best advice and prices. FREE Delivery on all Drennan End Tackle / Accessories over £100!! !